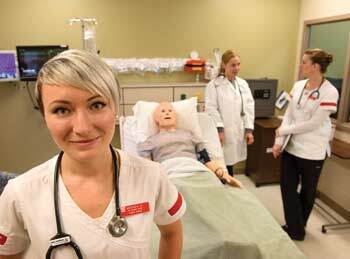 Maranda Windsor and her fellow nursing students at Casper College work in the Simulation Lab. Thanks to ReNEW, nursing students across the state can earn a bachelor’s degree without leaving home. UW works closely with Wyoming’s seven community colleges to offer students enhanced educational options and a seamless transfer process. In the fall of 2016, the University of Wyoming welcomed 976 new transfer students, a 4 percent increase from the previous year. Thanks to strong partnerships with Wyoming’s seven community colleges, it’s now easier than ever for students to seamlessly transfer and succeed in completing their bachelor’s degrees. Many questions come to mind for students who transfer from a community college to UW. The most important is whether the courses they have taken at that college will transfer and count toward their degrees at UW. In the past, many Wyoming community college students ended up with extra credits—courses that transferred but didn’t count toward degree-required coursework. This resulted in students taking longer than four years to graduate, which in many cases meant Hathaway and other funding sources dried up prior to them completing their bachelor’s degree. For nearly three years, UW has been working with all seven community colleges to remedy this. The results are rolling out now in the form of two-plus-two program articulation agreements, which outline for students which courses to take during their two years at community college and which they will take during their two years at UW to complete their degrees in eight semesters. “What these transfer articulation agreements do is give students a guarantee that if they take certain classes during their first two years, they will transfer as what they need, and they won’t be behind or have taken anything extraneous,” says Northwest College President Stefani Hicswa. The agreements will cover the majority of transferring majors, Noel says. The partnerships are ongoing, and yearly meetings will keep the program agreements up to date. “These two-plus-twos cover all six UW colleges. They run from the fine arts to the heavy STEM (science, technology, engineering and math) fields,” says Creative Writing Professor Alyson Hagy, interim dean of the UW Outreach School and a former associate vice president for academic affairs who has helped lead the effort. The work accomplished thus far benefits not only students but also their families and the state. “We know from the data that students who complete an associate’s degree before they transfer to the university tend to persist at a higher rate and complete at a higher rate when they get to the university,” Schaffer says. Community college nursing students across the state can now complete their bachelor of science in nursing (B.S.N.) degrees without coming to Laramie thanks to the ReNEW program—Revolutionizing Nursing Education in Wyoming. Not only is the program convenient and cost-effective for Wyoming’s nursing students, but it can also improve health care across the state, as baccalaureate-educated nurses are linked with better patient outcomes. The program took great effort by all parties involved and was supported by the Wyoming Workforce Development Council and funding from the Robert Wood Johnson Foundation. “With ReNEW, we were able to capitalize on our already existing strong community college partners,” says Mary Burman, dean of the Fay W. Whitney School of Nursing. Students complete three years at any of the six participating Wyoming community colleges, then complete a fourth year online through UW. Roughly 40 percent of Wyoming’s nurses have bachelor’s degrees, which is lower than the national average, Burman says. “As a result of ReNEW, we’ll see more people pursuing and achieving the baccalaureate in nursing as well as the university see its outreach efforts really take advantage of that network of the community colleges,” Schaffer says. ReNEW officially began in fall 2016 and is already seeing great interest from nursing students, with most saying they plan to complete their bachelor’s degrees via the program. While not new, the INBRE (IDeA Networks for Biomedical Research Excellence) program continues to build upon strong community college partnerships and to aid students in transferring successfully to UW. “The goal of the program is to help states that are underserved by the National Institutes for Health (NIH) build their biomedical research and education infrastructure so that they become competitive for NIH dollars,” says Wyoming Program Director R. Scott Seville. While most INBRE states form a network of in-state universities, UW has created a network with the seven community colleges. “We have a suite of programs that target the community colleges to help them build research infrastructure so that students are working in laboratories doing scientific investigations,” Seville says. These programs fund research-mentored projects at community colleges, fund partner projects between UW and community college faculty members and much more. INBRE also offers video-conference seminars and upper-level courses online to help students get ahead before transferring. Hicswa agrees: “The fact that our students are doing undergraduate research as freshmen and sophomores leads to people who want to be researchers. Our society needs scientific research, and the INBRE program makes that happen. INBRE’s transition fellowships provide funding for a number of top transfer students each semester. “The students must maintain a B average, and they commit to working approximately 10 hours a week in a research lab conducting independent mentored research with a UW faculty member,” Seville says. This semester, the program is supporting 19 transfer students. This past spring, Campbell County saw hundreds of layoffs in the coal industry. The University of Wyoming is working with the county on a number of fronts to meet the needs of residents. Creative Writing Professor Alyson Hagy, interim dean of the UW Outreach School and a former associate vice president for academic affairs who helped lead the articulation agreement efforts, is serving as President Laurie Nichols’ representative on the Energy Capital Economic Development Higher Education Task Force. In addition to UW’s work in Campbell County, the College of Engineering and Applied Science initially created 10 scholarships for former energy-industry employees and their children to pursue engineering-related degrees at UW or any of Wyoming’s community colleges. The college will actively raise money for additional awards.